Cynthia Enloe's riveting new book looks at the end of the Cold War and places women at the center of international politics. Focusing on the relationship between the politics of sexuality and the politics of militarism, Enloe charts the changing definitions of gender roles, sexuality, and militarism at the end of the twentieth century. In the gray dawn of this new era, Enloe finds that the politics of sexuality have already shifted irrevocably. Women glimpse the possibilities of democratization and demilitarization within what is still a largely patriarchal world. New opportunities for greater freedom are seen in emerging social movements—gays fighting for their place in the American military, Filipina servants rallying for their rights in Saudi Arabia, Danish women organizing against the European Community's Maastricht treaty. Enloe also documents the ongoing assaults against women as newly emerging nationalist movements serve to reestablish the privileges of masculinity. The voices of real women are heard in this book. They reach across cultures, showing the interconnections between military networks, jobs, domestic life, and international politics. 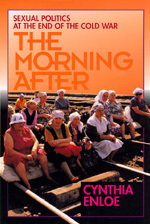 The Morning After will spark new ways of thinking about the complexities of the post-Cold War period, and it will bring contemporary sexual politics into the clear light of day as no other book has done. Cynthia Enloe is Professor of Government at Clark University and the author of Bananas, Beaches, and Bases: Making Feminist Sense of International Politics (California, paper, 1990), among other books.